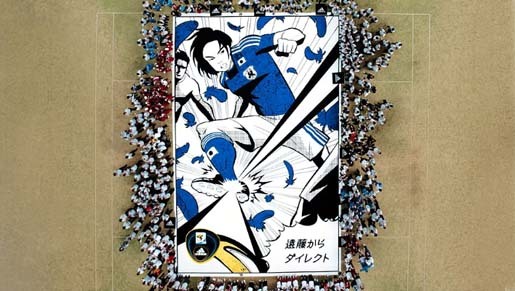 Adidas Japan and the Japanese Football Association have been preparing for the 2010 FIFA World Cup South Africa with the “adidas Sky Comic” project. 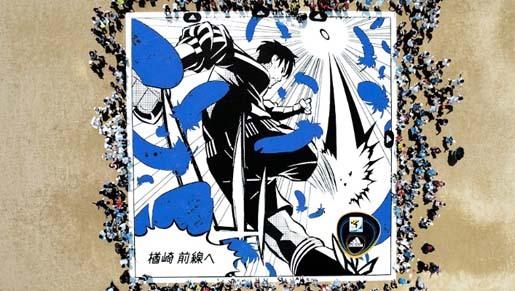 The project, which spanned 13 cities over five weeks, involved recruited football fans and national team supporters to create thirteen massive 300 square meter individual comic strip panels. The individual panels were photographed using a camera rigged to a remote controlled balloon. 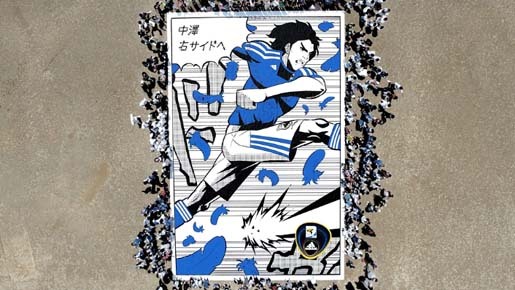 Photos have been uploaded to a dedicated adidas and JFA website where the entire story comes together as a digital comic book. 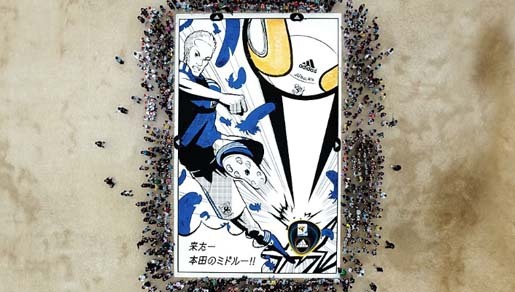 On May 25 the individual panels were assembled as a single giant comic strip at Haneda Airport, supporting Japan’s national football team as they left to compete in South Africa. 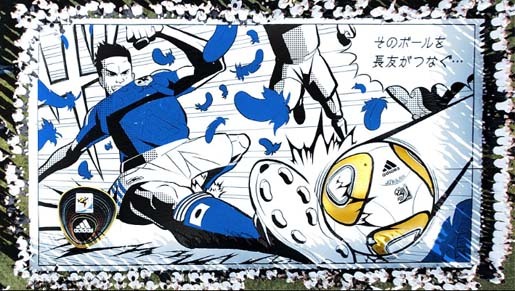 The first panel was created Tuesday April 20, featuring Takayuki Morimoto. 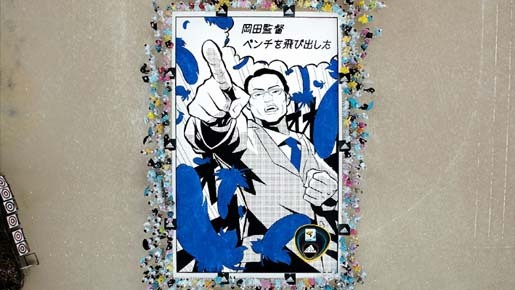 It took place at Morimoto’s home town of Kanagawa at the elementary school he graduated from. 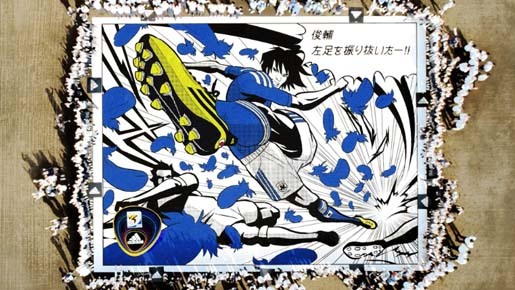 Students, teachers and parents were invited to paint the panel as well as write messages of support for the National Team. 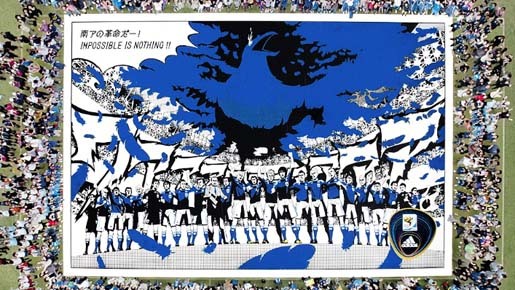 Additional panels, each featuring a different player and their unique part of the story, have been created at their repective home towns across Japan. 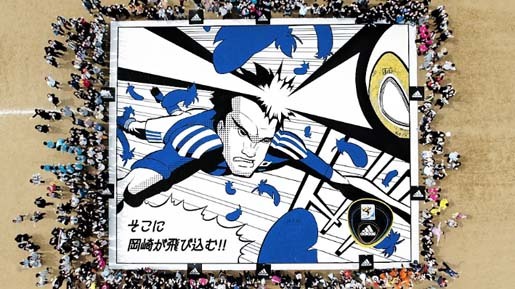 Three animated shorts, totaling roughly four minutes in length, are monochrome action flicks save for frequently brilliant flashes of blue and red that highlight an in-game football match between Japan and another country’s national team. 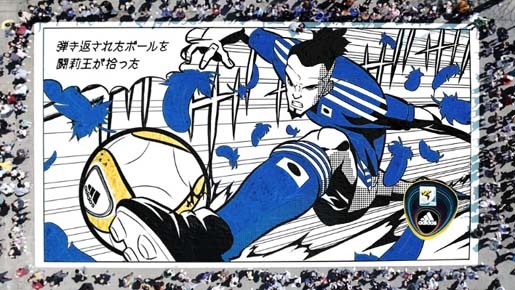 The videos broadcast a football match, using the hallmark pullout-stills and isolated character posing familiar to Japan-native comics and animation, aggressively stylizing the football match akin to a war for survival. 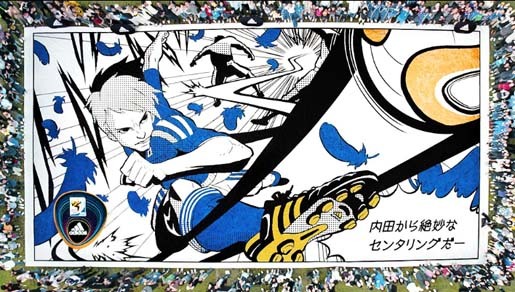 The digital motion comic is meant to profile the Japan team’s indomitable spirit and fortune, as best embodied by their jersey colors (blue/white) as well as the mythical creature the Yatagarasu, a three-legged crow/raven. The bird is a fabled emblem of prosperity, and in these shorts is fantastically rendered as the spiritual backbone of team Japan. The Sky Comic Project was developed at TBWA HAKUHODO by creative director Kazoo Sato, copywriters Hideyuki Tanaka, Masaharu Kumagai, art directors Hirofumi Nakajima, Haruhito Nisawadaira, Katsuhiro Shimizu, Keisuke Shimizu, account director Taro Sato. Comic artist was “TERU” Terukazu Matori, Masu Comix. 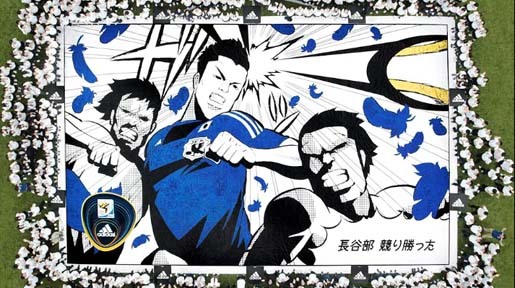 Animation was by director Daichi Yasuda via visual design studio VUNO. 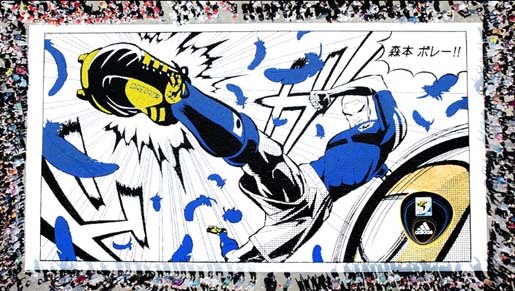 The Sky Comics were produced by Monster Ultra. The site was produced at Formes inc. BTS production was by Cocoon. Printing was by Magic Touch. Music is by Reiji Kitazato.